This ‘website’ and all of its contents is owned by Brice Australia Pty Ltd, ABN: 71 413 589 669 (herein referred to as ‘Brice Australia, “we”, “us”, “our”). For the purposes of these Terms “goods” or “equipment” means the goods or equipment sold by Brice Australia to you. Additionally, “you” means the person/customer to or from whom the goods are to be supplied by Brice Australia. All prices listed on the website are noted to be exclusive of GST. GST will be added to the price for goods at the end of your quote). Prices advertised on the website do not include any delivery fees unless otherwise stated. For this reason, goods are supplied by delivery only. Any delivery fees will be listed in your quote for goods. We strictly DO NOT grant or accept any trading accounts or credit accounts. Any orders for goods will not be released or delivered to you until we have received full payment in cleared funds for the goods and equipment, including any additional charges payment, including but not limited to GST and delivery fees). All quotes are an obligation free service and valid for a period of 30 days or until stocks last or prices change from suppliers, from the date of issue by Brice Australia, unless otherwise agreed. Pricing details, delivery estimates, and other financial information offered is current at time of display only. Prices are subject to change without notice (some photos are for illustration purposes only and may not reflect the relevant item in all respects). By placing a sales order by purchase order or requesting a tax invoice for the purchase of goods from Brice Australia implies that you as the purchaser agree to be bound by the Terms. Please contact us direct if you have any further enquiries before ordering any goods. Some items may not be in stock at the time of placing an order. One of our consultants will contact you within 24 hours to confirm delivery time and stock availability. Waiting times for goods can vary from 1-2 days for stocked items and in some cases approximately 6-10 weeks for special orders. All equipment deliveries of the goods will be made to the premises you advise us at the “ground floor kerbside” or the loading dock, unless otherwise stated in your quote or agreed to by us, and you acknowledge that if required, it is your responsibility to provide labour and required equipment to unload and position the goods on the premises at the your own expense.. You are required to notify us prior to deliver of any matters that may hinder the smooth deliver of the goods, including any stairs or other access issues preventing a smooth delivery. If delivery of the goods cannot be made due to matters we have not been advised of, the courier or deliverer has right to refuse delivery. If you do not notify us of any matters that may affect deliver, you will be liable for all charges incurred in respect of the inability to deliver the goods, including any extra delivery charges for re-booking fees and all storage fees. The purchase price does not include any on-site unpacking, placement or positioning of equipment or connection to services or removal of rubbish and packaging or any other matter not noted in your order. You are responsible to organise and pay for any electrical and plumbing connections and the cost of any necessary alterations to your premises. Brice Australia will complete the delivery of the goods on or about the date agreed upon in the order, but this obligation is subject to your premises being ready to receive the installation of the goods. All delivery dates quoted are estimates only. We will not be held responsible or liable for any delay in the delivery of the goods. We will take all reasonable steps to deliver goods on time however we are not responsible for any delays arising from transport, shipping, non-availability of ordered goods, strikes, lockouts, accidents, fires, wars, acts of God, non-delivery of material or parts by suppliers or any other cause or reason whatsoever beyond our reasonable control. No such delay shall excuse or justify client’s refusal to accept delivery of the goods and we will not be responsible or liable for any delays or costs that may occur as a result of late delivery. Risk in accepting the goods passes to you on delivery. When the goods are delivered, you are responsible for inspecting and checking the goods whilst in the presence of the courier or deliverer. If upon inspection the goods have been damaged in transit, please sign on the delivery/courier documents as “received damaged” and telephone our office immediately on 1300 664 880 to report such damage, and if possible, take and send photos of the evidence of the damage via mobile phone. Once you have taken possession of the goods upon delivery and have not reported any damage of the goods in transit as described above, you confirm that you have accepted the goods, and you will not be able to, and we will not accept, any claims or requested by you for the return of the goods, Brice Australia are not common carriers. Any special orders for “imported goods” require a 100% payment of the price of such goods and any additional charges, prior to Brice Australia making placing order for the goods with the supplier of such goods. For clarity, “imported goods” are goods that are not in stock and must be imported by Brice Australia. While all efforts are made to check pricing and other details, inadvertent errors do occur from time to time and Brice Australia reserves the right to decline orders arising from such errors. Whilst every possible care is taken, the pictures on this website are for illustration purposes only and may vary slightly from the selected item or size. In some cases, it is meant as a guide only. It is your responsibility to enquire with us directly to ensure the accuracy and currency of the material, prices or information you seek to rely upon. Whilst we take every reasonable care to ensure that the information contained on this website is true and accurate, we cannot give any guarantee or warranty to that effect. Please note that we cannot accept any responsibility for the contents of materials viewable from this website which are not provided or maintained by us. The goods purchased from Brice Australia are backed by genuine manufacturer or importers service warranties. If your goods are faulty within the warranty period as specified, please contact Brice Australia on 1300 664 880. In most cases goods are covered by a back-to-base repair warranty with the purchaser to pay for any freight charges. Please read the warranty carefully when purchasing goods. If you have are any further enquiries regarding warranty please contact Brice Australia either by email at info@briceaust.com.au or by telephone on 1300 664 880 before purchasing the goods. If goods are out of warranty, then you are liable to pay all further charges incurred after the date of expiration of the warranty. Warranties can be voided if you tamper, alter or have another third party repair any faults that may occur during the period of warranty without prior written approval from Brice Australia. If this is the case, you will be fully responsible and liable for the goods once the warranty is voided. 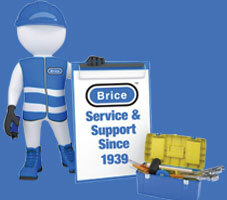 If goods received are faulty or there is obvious damage in any way, you should immediately (within 24 hours) notify Brice Australia on 1800 664 880 or email info@briceaust.com.au listing your contact name, address, phone and fax numbers, our invoice number and details of the fault or what is wrong with the goods. Any delivery dockets or consignment notes must be kept and submitted to Brice Australia for claims against transport companies. It may be necessary to forward photographs by form of email, phone or post for any items sent in order to assess damage to goods. any special, indirect or consequential loss or damage of any nature whatsoever caused by our failure to complete or delay in completing the order to deliver the goods. We are not responsible and accept no liability for loss or damage arising from the website failures or downtime. Cancellation cannot occur on the day that goods are sent or already collected by the courier. This will not be accepted as sufficient cancellation notice and you will be liable to accept the goods. A cancellation fee will apply to all cancellation orders being a minimum of 20% to 40% of the purchase price for any tax invoice instructed by you to issue or goods incorrectly ordered with any additional transport costs incurred. You will be issued a credit note of the balance of monies paid. Goods being returned for credit must be arranged with Brice Australia and is at your own expense to return the goods at a nominated return address as instructed by Brice Australia. All goods returned due to change of mind are subject to a 20% to 40% restocking fee on purchase price depending on manufacturer, and will only be accepted if returned in original condition unused with packaging, warranty cards and instruction manuals. If the returned item has been used in any way, it will not be accepted by Brice Australia and no credit will be issued. Any goods to be returned must be arranged with Brice Australia in advance and only then at our discretion can items be returned to our warehouse for credit. There are also, strictly, no refunds for specially imported orders. Due to continual improvement to the goods for sale on the website, the manufacturer or supplier of the goods may from time to time change specifications, sizes, colours and other details as they relate to the goods without prior warning. As such, we will use our reasonable endeavours to advise of you any such changes. All equipment sold comes with instructions and it is essential that you make yourself familiar with these details. Some equipment’s operations are simple; others require a more detailed explanation, especially if you have not used the type of equipment before. Please note that you are liable to pay for all electrical and plumbing connections or modifications and the cost of any necessary alterations to your premises. Essential to all equipment, we recommend that you implement a periodical service maintenance program to assist in maintaining the overall performance of the equipment. Illustrations, sizes and colours use on the website are a guideline only. Manufacturing changes can result in variations to illustrations, sizes and colour of the goods noted on the website. All measurements and capacities are approximate and can vary due to manufacturing changes. The depiction of colours is as accurate as reproduction allows. Delivery of illustrated goods are subject to availability and Brice Australia cannot be held responsible for delays. Any goods noted on this website may be discontinued without notice. This website is for the general information in order to purchase the goods, and whilst all care has been taken, information in this website is not to be taken as a substitute for specific advice. We accept no responsibility for any person who acts on the contents of this website. The website “briceaust.com.au” is subject to copyright under Australian laws. The copyright in the content on the website is owned by Brice Australia or owned by other third parties who have granted licences/s to Brice Australia. You must not copy, communicate to the public, adapt, transfer, distribute or store any of the contents on this website including but not limiting any text, pictures or incorporate any part of the website into another website without obtaining Brice Australia’s prior written consent. This websites also includes registered and unregistered trademarks. All trademarks displayed on the website are trademarks of their respective owners. Your access to or use of this website does not constitute or create a license or any other right to use the names, trademarks, copyrights or any other intellectual property of Brice Australia or any other party contained on this website. To the full extent permitted by law, you agree to, and will indemnify Brice Australia and keep us indemnified from and against any liability and any loss or damage we may sustain, as a result of any breach, act or omission, arising directly or indirectly from or in connection with any breach of any of these Terms by you or your representatives. Third parties may intercept or modify transmissions to and from this website and it is possible that computer viruses or other defects may be contained in files obtained from or through this website. Brice Australia is not liable for any damage that may be a result of your use of this website or of any linked website. These Terms and Conditions are updated in accordance with the laws from time to time. The parties to the Terms submit to the non-exclusive jurisdiction of the Courts of Australia and any courts which may hear appeals from those courts in respect to any proceedings in connection with these Terms and Conditions. These Terms and Conditions contain all of the terms and conditions of the contract between the parties and may only be varied by agreement in writing between the parties. Any terms or conditions found to be void, unenforceable or illegal may, to that extent be severed from the Terms and Conditions. No waiver of any of these Terms and Conditions or failure to exercise a right or remedy by Brice Australia will be considered to imply or constitute a further waiver by Brice Australia of the same or any other term, condition, right or remedy.